ARE YOU READY FOR A FIRE? Fire is one of the most common disasters. Fire causes more deaths than any other type of disaster. But fire doesn't have to be deadly if you have an early warning from a smoke detector or a CO alarm everyone in your family knows how to escape calmly. Smoke detectors save lives. Install a battery-powered smoke detector outside each sleeping area and on each additional level of your home. Use the test button to check each smoke detector once a month. When necessary, replace batteries immediately. Replace batteries at least once a year. Have a working fire extinguisher in the kitchen. Get training from the fire department in how to use it. To reduce the risk of electrical shock, install GFCIs (ground-fault circuit-interrupters). GFCIs shut off faulty electrical circuits and equipment more quickly than conventional fuses or circuit breakers. The devices are inexpensive and can be hardwired into your home's electrical system by a qualified electrician. Liquids like gasoline, kerosene, and propane are highly flammable. Make sure to store these liquids outside the home and away from sources of ignition. Store them only in small quantities and in their original containers or in safety containers. Never bring even a small amount of flammable liquid indoors. The vapors are highly flammable and can be ignited by a tiny spark. Keep cooking areas clean and clear of materials that could catch fire, such as pot-holders, towels, rags, drapes, and food packaging. Give space heaters plenty of space. Space heaters should be at least three feet away from anything that could burn. Always make sure to turn heaters off when leaving the room or going to bed. Solid-fueled heating equipment, including chimneys, chimney connectors, fireplaces, and wood or coal stoves should be inspected by a professional every year and cleaned as often as necessary. This also applies to all other types of fueled heating equipment, including central furnaces and space heaters. Lit candles should be monitored constantly by an adult and extinguished when adults leave the room or go to sleep. Use candleholders that won't tip over easily, are made of noncombustible materials and are big enough to catch dripping wax safely. Never leave children alone with burning candles. Keep matches and lighters high up and out of children's sight and reach - preferably locked in a cabinet. Fire can grow and spread very fast. In a typical home fire, you may have as little as two minutes to escape once the smoke alarm sounds. Each year fires kill more than 3,500 people and injure tens of thousands more in the United States. Children ages five and under are twice as likely to die in a fire as the rest of the population. Home fire escape planning and practice can make a critical difference for your entire family. By developing and practicing a home fire escape plan, your family will know exactly what to do in a fire so everyone can escape quickly and safely. Draw a floor plan of your home. You'll need two ways out of every room. One way out would be the door, and the second way out may be a window. Consider purchasing a home fire escape ladder for bedrooms located on the second and third floors. Remember, smoke rises. Ceiling-mounted alarms should be installed at least four inches away from the nearest wall; wall-mounted alarms should be installed four to 12 inches away from the ceiling. Don't install smoke alarms near windows, outside doors, or ducts where drafts might interfere with their operation. Don't paint your smoke alarms; paint or other decorations could keep them from working when you most need it. Replace the batteries in your smoke alarms once a year, or as soon as the alarm "chirps," warning that the battery is low. Helpful hint: Schedule battery replacements for the same day you change your clock from daylight to standard time in the fall. Regularly vacuuming or dusting your smoke alarm following manufacturer's instructions can help keep it working properly. If you live in an apartment building, make sure that you're familiar with the building's evacuation plan. In case of a fire, use the stairs, never the elevators. If there are infants or family members with mobility limitations, make sure that someone is assigned to assist them. Be fully prepared for a real fire. When a smoke alarm sounds, get out immediately, and once you're out, stay out! Fires and burns continue to be a major cause of unintentional injury and death at home. Particularly at risk are the very young and the very old. Nearly 4000 Americans die each year in house fires and over 2000 are severely injured. In only 3 1/2 minutes, the heat from a house fire can reach over 1100 degrees Fahrenheit. About 80% of all civilian deaths from fire occur in the home. In rooms that are not even on fire, the temperature can reach over 300 degrees; this is hot enough to melt plastic and kill the people in those rooms. Adults 65 and older are more than twice as likely to die in fires as the overall population. The leading cause of fire deaths is careless smoking. Having a working smoke detector more than doubles one's chances of surviving a fire. In 2005, 106 firefighters died in the line of duty in the United States. Fire produces gases and fumes that can make you sleepy, weak, and confused. You can't smell these fumes, so if you are asleep the smell won't wake you – but a smoke alarm will. Unlike fires in the movies, the smoke from a house fire can be so thick that your house would be completely dark in 4 minutes, even with all the lights on! Faulty appliances/wiring cause the greatest number of house fires. Heating devices such as heaters, wood stoves, and fireplaces, are another leading cause. Most often the fires start when something like furniture, boxes, or clothing placed too near the heat source overheats and ignites. Cigarettes are another leading cause of house fires. Most often the fires start when a cigarette was dropped on to furniture like beds, sofas, or chairs before bed. Children playing with fire cause many injuries and house fires every year. Two out of three people who die in house fires were asleep when the fire began. Smoke alarms increase the chances of surviving a house fire by 2 to 3 times. Always install a smoke alarm just outside the sleeping areas. Change the smoke alarm's battery once a year or when the alarm chirps. Never remove the battery from the smoke alarm without replacing it. What a smoke alarm sounds like: Some children run and hide when an alarm sounds a house-fire warning. Making and practicing a house fire escape plan helps them respond appropriately to the alarm. What a firefighter looks like at a fire: Acquaint your children with the equipment a firefighter may be wearing and/or carrying. Air masks, the heavy breathing sounds they produce, and axes can be frightening to children who may hide instead of responding to their calls. Escape routes: Always teach children two ways out of every room (i.e., window and door). Stay low during escape: Crawl as close to the floor as possible under the smoke to a safe exit. Test the safety of their exit route: Use the back of the hand to test if a closed door is hot. If it is hot, use another way out. Where to meet after escape: Everyone must meet at a previously designated meeting place outside the home so that firefighters know that all persons are out of the house. How to call for help: Call 911 from a neighbor's home. Stay out: Never go back inside a burning home to get anything such as toys, clothes or pets. One is definitely NOT enough! 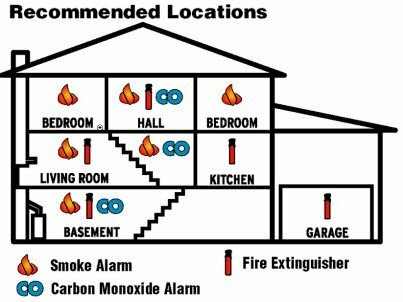 Every home should be equipped with smoke detectors on every level, particularly outside of sleeping areas. Ensure that your smoke detectors are tested monthly and batteries are replaced twice a year. Change batteries when you change your clocks. Encourage children to help test the smoke detectors. Familiarize them with the sounds of the alarm(s). It's a good idea to keep fire extinguishers near the furnace, garage, and anywhere else a fire may start. These extinguishers are affordable, life-saving equipment for your home. If you must use an extinguisher, make sure you have a clear way out in the event you can't put out the fire. Keep matches, lighters, and candles out of reach and out of sight of children! Smoking is dangerous! No one should ever smoke in bed. Make sure that cigarettes/cigars are extinguished properly before dumping ashes. Avoid grease build-up in the kitchen and on appliances. Cooking fires are common. Don't leave food cooking on stovetops unattended. If a fire should occur, suffocate it with a pot/pan lid or a cookie sheet, or close the oven door. Around the holidays, Christmas trees are a primary concern. Consider using an artificial tree that is labeled "flame resistant." If you do use an evergreen, water it daily to keep it from drying out. Make sure to inspect stringed lights and window ornaments annually for deterioration. Never put children to sleep in "day" clothes. Fire-retardant sleepwear can make a difference in burn outcomes. Make sure your electrical system is not being over-taxed. This can cause a fire. Do your lights dim or flicker when extra appliances are plugged in? If you have questions or concerns, consult a certified electrician. Inspect wires. If you find any worn or exposed wiring from appliances, discontinue their use immediately! A fire is imminent! Space heaters can be dangerous if not used correctly. Make sure yours will automatically shut off if tipped over. Consult the operating instructions to make sure you are using space heaters, gas fireplaces, and other heat sources as intended by the manufacturer. Keep all flammable materials away from heat sources! If there are young children in the house, make sure space heaters and hot water heaters are inaccessible. Chimney fires are common. Have your chimney inspected and cleaned annually. Draw a map–one that's easy for all members of the family and visitors to understand. When planning for a family with young children, be sure to teach them not to hide from fire or smoke and to go to firefighters who are there to help them. All children should be familiar with the ideas of "crawling underneath the smoke" to escape a fire. "Stop, drop and roll" is another safety principle that must be ingrained into children's minds. Multi-storied buildings are of special concern. Ensure that everyone is familiar with how to use an escape ladder if necessary. Make sure every sleeping room has two means of escape in the event of a fire. Windows provide a secondary means of escape. Ensure they are in proper working order, are not painted shut, and guards are able to be disengaged in case of fire and escape is necessary through that window. Everyone must understand that once you escape, you must never reenter a burning building–no matter what you might have left behind. Call emergency responders (911) from a neighbor's house. Young children should know their street address and last name (and, of course, how to dial 911). After you've planned for the family, don't forget the pets. Alert firefighters about your pets. Don't rely on window or door decals to alert firefighters–such decals are often found to be outdated. In the event your pet suffers from smoke inhalation, rush the animal to the vet.